This month we focus on horse power and put the new BMW R 1200 GS-LC up against the KTM 1190 Adventure R, the results might frighten you! 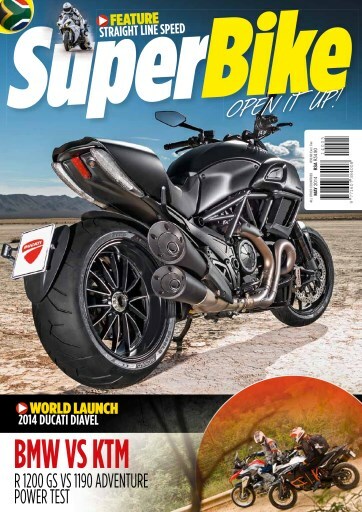 We then take a trip to Monaco to ride the face-lifted version of the Ducati Diavel. We continue with horse power, but this time in the shape of middleweight superbikes, we take an MV Agusta F3 800, a Suzuki GSX-R750 and a Ducati Panigale 899 head to head to see which is the best to buy. Yamaha launch 3 new bikes in SA and we were there to ride them all.